These steps can be used to either get an image from the store or the gallery and then link them (so that people can just click on the image in your post and be taken to the store or gallery). Important: First make sure your settings are correct: Go to User CP (top left hand corner on brown toolbar)>Edit Options>Make sure the last setting on this page "Message Editor Interface" is set to the "Enhance Interface - Full WYSIWYG Editing" Option. Note: Have two browser tabs open, one with layout in the gallery OR store product and the other tab with the post you want to copy it to. 1. Go to the gallery or the store and open your layout or a product. For a product: Right click on the product image and select the Copy Image Address (Chrome browser) - you may have different wording if using another browser. 3. Navigate to the post where you want to put the layout or product image. 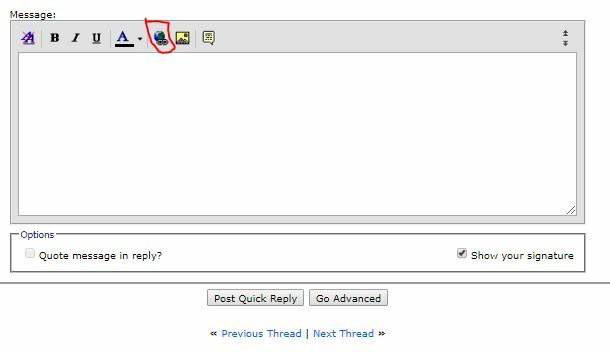 Click on the 'yellow mountain' icon and paste the copied link (CTRL+V) into the box that opens and then click OK.
That is all you need to do to post an image of a layout or product into the forum. 5. 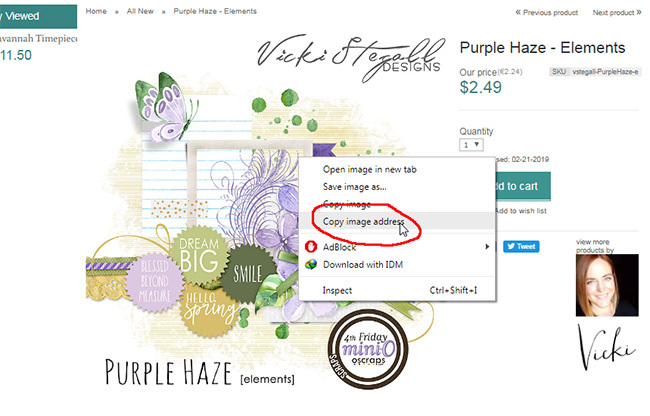 Go back to the layout in the gallery or the product in the store and copy the URL address at the top of your browser. Simply click on it to highlight it and then use CTRL+C to copy. 6. Go back to your post. Make sure the entire code is still highlighted! Now click the LINK button on the toolbar, the "Blue world with a chain link" symbol. 7. Then paste (CTRL+V) the URL link in the box that pops up and click OK.
8. You are Done! After posting your post, when you hover your mouse over the layout or product image, you will now will see the 'little hand' symbol to indicate that your page is 'clickable'. This allows other people to click on it to go straight to the gallery to leave some love on your page or go straight to store to see the product! You can always check to see if your links and images are appearing before you post. Then click the Preview Post button. The preview appears but if you want to change anything, scroll down to the bottom to find the Editor screen. After any changes you make you need to click the Preview Post button to see the changes. When you are happy with everything you can then go ahead and click the Submit Reply button to post in the forum. Last edited by wombat146; 03-18-2019 at 11:34 PM. This is awesome Ona!!! Such easy to follow instructions!! Ona, I haven't tested your method yet with Anna's FB groups, but when I used the link below the photo, I only get an image in FB that IS clickable but not to the gallery with credits. I want people to see what I've used also so...how do I do that? I'm not sure exactly what you are trying to do Maureen, so I might be misunderstanding, but I don't think Facebook posts are going to work the same way as posting in the forum here at Oscraps. 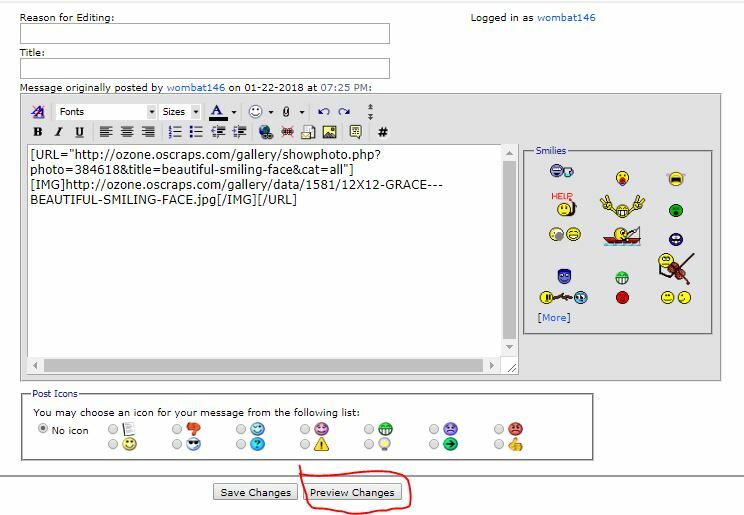 Ona's directions are for when you are posting something in a thread here at the Oscraps forum and you want that picture to be clickable and take you to your layout in the gallery. Are you trying to upload something to Facebook and make it link back to the gallery here at Oscraps? Thanks Sara. I was hoping that, in Facebook, I could use 'copy image address' to add the gallery full image and have that link back to the gallery. Nope. 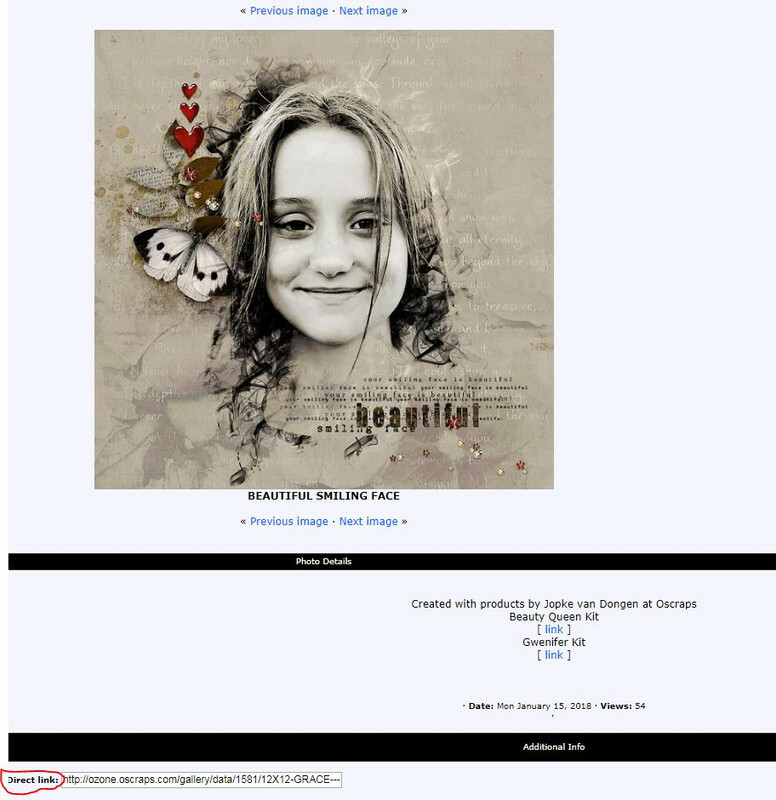 I do know how to make a linkable image in many forum galleries. The only thing that seems to work for me is to upload my full image (ha FB, you're getting a big file!) and then say...For Credits (and insert the url address from the top of the page.) I don't see any simple way to make my photo be linkable itself in FB. Got it! I haven't tried to do that in Facebook. Maybe someone else has an idea! Maureen, not sure about that in FB either. I guess the only thing you need to think about there is if you are Hotlinking from the O to Facebook. Sara would know more about that but I would think that linking from the O to anywhere else in digiland would create a Hotlink, ie, using Oscraps to 'host' the image at the other site. Perhaps Sara or Vicki might clarify that? Always a good topic and tutorial to keep alive. Thanks so much Ona!